Melt the butter in a medium skillet over medium high heat. Add the onions and cook until 2 to 3 minutes, or until starting to soften. Add the zucchini and squash, sprinkle with salt and pepper, and stir to cook for 3 to 4 minute. Remove from the heat and set aside. Grill the tomato slices on a grill pan or simply sear them in a hot skillet. Remove and set aside. Bring a medium saucepan of water to a gentle boil. Add the vinegar. Use a wooden spoon to carefully stir the water into a circular “whirlpool.” Crack one egg into the water and allow it to swirl around in the water until the egg begins to set. Let it stay in the water for 1 minute, then remove it with a slotted spoon and set it on a plate. Repeat with the other egg. If eggs need to be cooked longer, just add them back to the water for 30 seconds at a time. 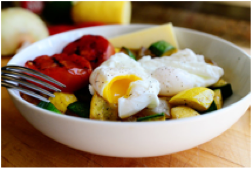 Spoon the vegetables on a plate or in a bowl and set the eggs on top. Lay the tomato slices on the side. Place the cheese slice on the side so that it starts to soften from the heat. Sprinkle eggs with salt and pepper and serve! Note: Add a link or two of chicken or pork sausage if desired.